Welcome back by again, sweet blog friends. 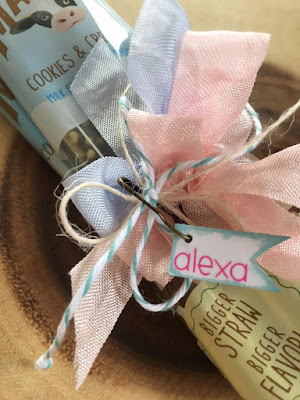 Today I'm sharing a quick little project I put together for my sweet niece, Alexa. 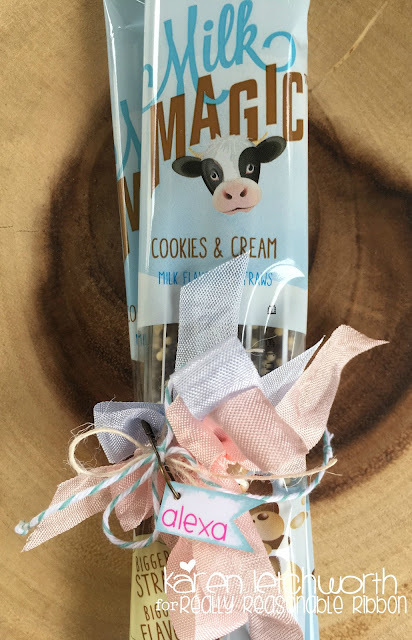 I bought these fun little Cookies & Cream and Chocolate Peanut Butter flavored candy straws for drinking your milk, and I knew Alexa would enjoy these. I love sending her little goodies to let her know how much I love and miss her. Really Reasonable Ribbon helped me make it easy to bundle these straws together and tie a sweet bow to send them to her. I made this simple project to prove a point. Anything But a Card is an easy and fun challenge. You can decorate just about ANYTHING with ribbon. Do some recycling, up-cycling, or just get creative. Then, top it with some ribbons and trims from Really Reasonable Ribbon. And there...you have the perfect entry for this fun new Anything But a Card Challenge at Really Reasonable Ribbon. We hope you will join us. Karen, what a fun treat for your niece and I'm sure she will love how you personalized it. This is so cute. Who wouldn't love to get these in the mail? What a sweet project Karen - perfect for a young girl.